How to give and remove access to apps. Simplicity: If your user doesn't need access to certain apps or packs, there's no need for them to be displayed! Removing access to an app means it will not appear on the user's dashboard. Security: Not every Method user needs access to your entire Method account. Permissions allow you to limit a user's access to sensitive information like accounting. For more information on apps and packs, please see What are apps and packs? 1. Click the Gear icon and select Preferences. 2. Select Users on the left menu. 3. Select the user you wish to manage and click on their name. 4. 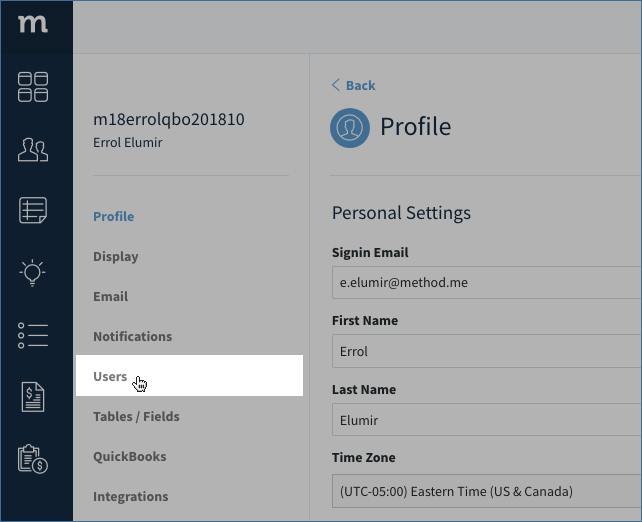 Click Manage User Permissions & Subscriptions. There are several levels of permissions you can grant a Method user. The first two options pertain to permissions that will apply to every app and pack the user has access to. - User will be able to make changes to subscriptions that affect Method pricing. - User can access the manage link in the contextual menu on the app. - User can customize screens within all apps they have access to. In the below example, we are giving the user access to all the apps in the Sales Transactions Pack (not all apps shown). Edit: Method user can make edits to a record. Note: When editing a transaction, adding or deleting line items is considered an Edit permission, not a Delete permission. Delete: grants Method user the ability to delete a record within this app. If this is unchecked, user will not be able to delete any record related to this app. For example, the Activity App has Activity Types and Activity Statuses. The user will be unable to delete an activity as well as the activity types and activity statuses if the delete permission is removed. Click Save at the bottom of the screen to apply these settings.